SUNAPEE, NH—Taking a deep breath and slowly regaining his composure as he reflected on the disaster he had narrowly averted, Republican presidential candidate Scott Walker appeared visibly relieved after managing to stop himself just short of acknowledging immigrants’ humanity while speaking at a campaign event Friday, sources confirmed. “Oh, man, I almost referred to them as ‘people’—I’ve got to be more careful next time,” said Walker, who was able to successfully redirect his line of thought toward ending birthright citizenship after catching himself on the verge of expressing genuine sympathy for the struggles faced by illegal immigrants in the U.S. “I was this close to saying I understood the difficult choices they have to make and recognizing that many of them come here hoping for a better life—hell, I nearly identified with them as parents! Thankfully, I stopped just in time and went straight into my standard lines about defunding sanctuary cities. 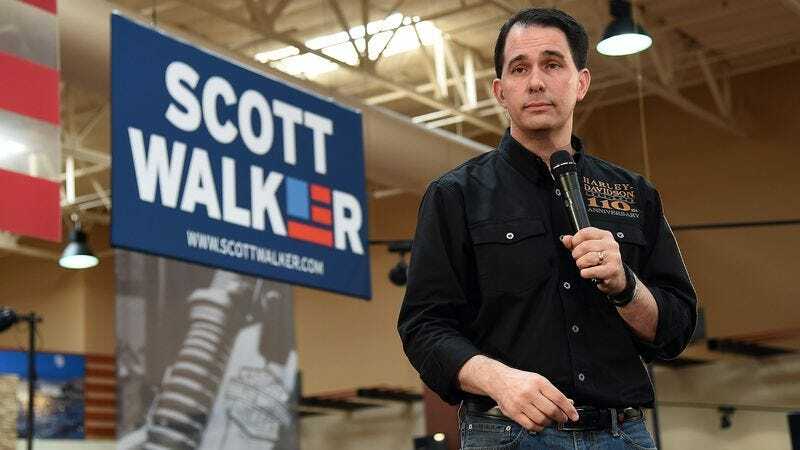 But, boy, that was way too close for comfort.” At press time, sources reported that Walker appeared to be comfortably back in his element after characterizing welfare recipients as lazy and manipulative drug addicts.